The spacecraft (SC) will start from the Earth and due to the multiple gravitational maneuvers (GM) near the Venus will comes nearer to the Sun, saving due to it the fuel and reducing the time of the flight to the operational orbit. GMs near the Venus will allow also to incline the plane of the SC orbit with respect to the ecliptic plane and to carry out the observations of the near polar regions of the Sun. 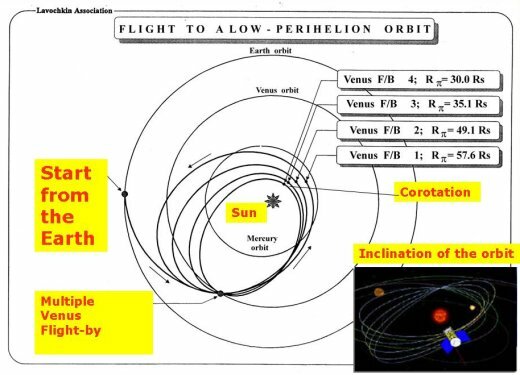 In perihelion on the distances about 40 solar radius the corotation will take place, i.e. within approximately 7 days SC will synchronously rotates with the Sun, hanging above the subsolar region. The corotation will allow carry out the special observations and in-situ measurements. 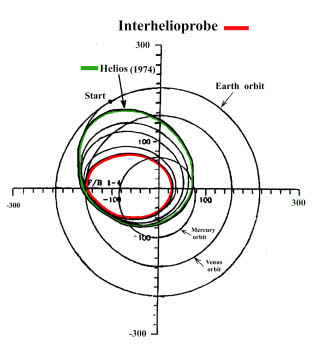 Comparison of the operational orbit of the INTERHELIOPROBE (red) with the Helios-1,2 orbit (1974) (green).